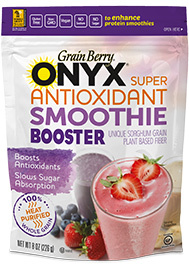 Grain Berry Smoothie Booster is a simple way to add the powerful health benefits of Onyx Sorghum to any smoothie, hot or cold cereal, hamburgers; most any food or beverage. Our Nutrition Boosters come in easy to use resealable pouches containing a free-flowing, fine powder to mix in your foods and beverages. We use a special heat purification process to insure the safety and nutritional integrity of our Onyx Sorghum.